The Air Mouse GO Plus with Compact Keyboard from Gyration is an innovative mouse, which can be used to control your computer's cursor from the air or on your desktop. Hold the wireless mouse in your hand and move it to and fro to control the cursor, or use it as a standard desktop mouse with laser tracking. 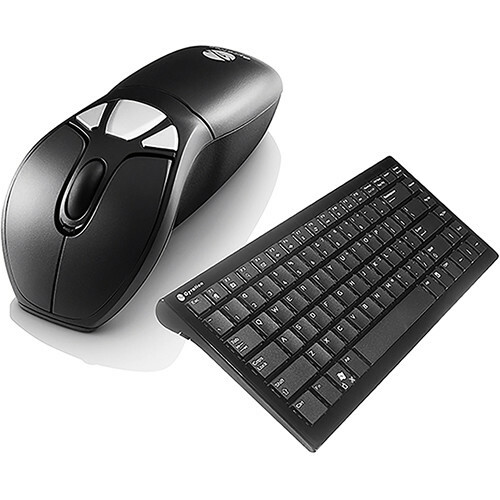 The mouse is bundled with a compact wireless keyboard. Compatible with Windows XP and Vista systems, the mouse features a symmetrical design for ambidextrous use. The mouse features 3 programmable buttons, including a scroll wheel, and non-programmable right and left buttons. Powered by a rechargeable NiMH battery, it is designed with desktop users in mind. Box Dimensions (LxWxH) 17.1 x 8.3 x 3.6"
Air Mouse GO Plus with Compact Keyboard is rated 4.0 out of 5 by 5. Rated 4 out of 5 by Anonymous from Mouse is AMAZING. Keyboard not as much If I were only evaluating the Air Mouse, it would be 5-stars (you can buy the mouse separately if you'd like). I liked the idea of also having a small wireless keyboard as well so I bought both. The keyboard works fine, but they should have made it a BIT bigger, so that they could make decent size 'Control' 'Backspace' and 'Delete' keys, which instead are the same size as other keys. This makes 'touch-typing' more difficult. Otherwise, works fine. Mouse - Simply amazing. If you're not willing to spend a day or two coming up the 'learning curve' you will become frustrated quickly, but if you're willing to take the time, it's worth it. Once you're accustomed to it, it's very intuitive; and the more you use it, the better (e.g., more precise, use more functions, etc.). The fact that you have a 'fall-back', meaning that you can put it down and use it as a regular mouse if you need to, means that you really have nothing to lose except the cost. Rated 5 out of 5 by Conference Room Casanova from Great Product & Easy Setup We use these for our conference rooms, which we have 3, and they work great. I experience no delay and the initial setup is just plug and play. Presenters really like the air mouse and the freedom it presents. I wish the keyboard was rechargeable, I hate replacing batteries. Rated 1 out of 5 by Anonymous from Sorry I bought it. I like the keyboard but the mouse has not worked, a total waste of money. I sent an e-mail to the link on their web page and did not even get the courtesy of a reply. I want to keep the keyboard and get rid of the mouse. Rated 5 out of 5 by THX Man from Satisfied customer Product is easy to set-up and most important I can use while relaxing without being adjacent to a work table or flat surface. Rated 5 out of 5 by tomboy6 from Had it for almost 2 years now I use the mouse and keyboard everyday. I only use the air feature of the mouse once in awhile. It is a bit hard to control but no big deal for picking a movie, I'm not trying to do slide show at a meeting. Sometimes I do have a hard time with the mouse picking up signal but just have to be a bit patient usually when on desktop. It seems to do just fine when I'm on the couch or carpet. I do not use the three silver buttons as I could never remember what I programmed them to do! LOL The only time I get aggravated with my keyboard is when I am doing speed word games and I type really fast then backspace (repeat quickly) and it will lock up. I just take the battery out for a sec and when its back in everything is fine. It's not perfect but still amazing for wireless. I still love it because it types so quiet I can have a conversation on the phone and the other party has no idea I'm typing and therefore I give it 5 stars. When my friend comes over he gripes about it but that's ok, its not his mouse/key board. :) The main reason I got it was not because its wireless, I got it when I was looking for the quietest keyboard and it just happen to be wireless. Now I'm addicted to it because I use my 55 big screen TV as a second monitor to watch Netflix movies and I can just take both mouse and key board and sit in front of the screen. will this work if my screen is in a different room then the computer? It very much depends on your intended use. The limitation is the signal to the USB receiver attached to the computer. With clear line of sigh, I find this device works reliably about 8'-10' away. If you go through walls or other obstacles it may lessen the range of use. So the closer you can be to the computer the more reliable use you will have. Point is: Placement of the screen isn't really important. Proximity to the where the USB receiver is connected is very important.